Peter Berley is a working chef, cookbook author, and culinary instructor. Peter’s foremost concern is the development of local sustainable food systems and the fate of home cooking in America. Former executive chef of the world-renowned Angelica Kitchen restaurant in New York City, he is Chef at The Culinary Loft in NYC, holds classes at The Institute of Culinary Education and The Natural Gourmet Institute in Manhattan, The Brooklyn Kitchen in Williamsburg, Ger- Nis in Park Slope and works as a personal chef in East Hampton in the summer. 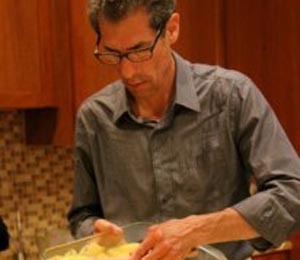 In October 2011, Peter opened his own Culinary Studio and Teaching Kitchen in beautiful South Jamesport, Long Island. Berley has contributed to Edible Brooklyn, Food and Wine, Bon Appetit, Everyday with Rachel Ray, Natural Health, Cooking Light, and Fine Cooking magazines. His ground breaking “The Modern Vegetarian Kitchen” received both James Beard and IACP Awards. A second book “Fresh Food Fast” was chosen as one of the 25 Best of 2005 by Food and Wine Magazine. “The Flexitarian Table: Inspired Flexible Meals for Vegetarians, Meat lovers and Everyone In Between,” was released in 2007. He can be seen in Vegetarian Cooking segments of Conscious Cuisine series for the FoodNetwork.com.